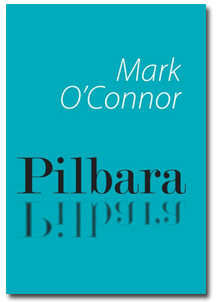 New book about the Pilbara launched on 15 November 2009! The Pilbara is a vast semi-desert region in Western Australia. Being further from the equator than the monsoonal Kimberley region to its North, it is drier and generally hotter. The weather station at Marble Bar has recorded the region's claim to be the hottest place on Earth: 160 consecutive days of more than 100 degrees Fahrenheit. On 24 October 2002 its main coastal city, Port Headland, recorded Australia’s highest ever temperature in the shade: 46.9 degrees Celsius. The animal species that survive there are largely marsupials. Crocodiles and buffalo are absent from this semi-desert; and even fox and rabbit seem not to invade except in favorable seasons. Only in the deepest cracks­the famous gorges­are there deep eutrophic greens. Geologists love the region, not just because there is little plant cover to get in the way of the rocks, but because it retains some of the oldest continental (‘sialic’) crust ever created on this watery planet. The crust formed back in the period more than 3 billion years ago that geologists call the Archaean. In parts of the Pilbara today you walk a re-exposed Archaean surface. For instance, the lava-flows at the coast near Roebourne are 3.2 billion years old­as old as some of the lavas from the maria of the moon. The land has a timeless look, and in fact remarkably little has happened to it since the dramatic events of the Archaean, which is why the earlier rocks are so well preserved. In the late Archaean, volcanic and other rocks to a depth of 3 or 4 kilometres were piled onto much of the original surface. Some survive as the Fortescue Plateau. Yet geologic truth is the daughter of time. Within a few billion years, such a topdressing of later rocks can erode away to re-establish something like the original surface-contours­so that today you may find a renewed early-Archaean stream prattling away in its valley and leaping from rocks of resistant gabbro. The following poems were written on an expedition with the geologist Andrew Glikson who generously shared with me his decades of experience of the Pilbara. Though geology is only part of what the poems describe, I have hoped the reader is willing to master a smattering of the geologic history, and for two reasons. Firstly, because without it the Pilbara’s landscapes can make little sense; and secondly because I believe the best poetry tends to be that in which real things are rightly respected. Sample poems and prose for Pilbara. returns to hymn his own creation. sharp as the spurt in a short-struck match. almost within the planet's average day. ­--a progress down the heartless scales of time. This is not just nature poetry. O'Connor changes (has changed) the way we write about 'nature' in Australia: he has a scientific vividness that I find unparalleled in his contemporaries. Sometimes I find him hard to read. There's his ego-challenging tendency to focus on an insect or a flower, with little or no reference to Me or My Wretched Soul That Seeks A Mirror. There is also a precision, an incredibly complex vision that takes in science, philosophy, history and semiotics. ... On p. 5, a Sturt's Desert Rose is born and dies with intense drama. The flower here is being carefully constructed in language, which at the same time it throws off, and is allowed to throw off. While its petals may resemble 'bridal silks', it is the flower who is being compared to the bride, not the other way round. And the near awkwardness of such a comparison here, with a flower that seems almost monstrous, is haunting. This book has a classical sense of fate, an awe and respect for harshness and fragility. It is a poem about time, survival, chance, beauty, the sublime, death, unintentional human cruelty, human indifference, limitation and folly. Much contemporary poetry tends to be more aware, or rather, more seeking of, our small place in the world. O'Connor assumes no such place. This is a world that is indifferent to us, yet vulnerable to being damaged by us. And at the same time we are part of it. In breaking away from the Romantic idea of nature as a refuge for human suffering, a backdrop for human dramas about the sublime, O'Connor prises open new possibilities, new ways of seeing, and speaking of, what is there. The Pilbara is not there to soothe the troubled spirit (or body). ... What is being set up here is, if you will, an 'unnatural' attitude towards nature. A deliberate unconditioning, a will to see it as 'other', which makes it possible to begin seeing it at all.